The palm fringed beaches of Diu transports you to a fairytale land of sheer beauty and exotic ambience. There are many beaches around Diu Island, with Nagoa and Jallandhar being quite famous for its serene beauty. Both these beaches are south-east of Diu island. 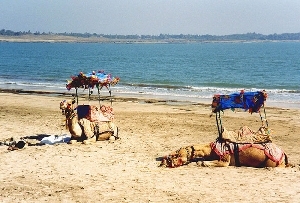 Eye catching Diu beaches attract tourists from all over the world. The Jallandhar Beach in Diu is exceptionally beautiful and quiet. Lazing around the beach or playing with the cool waters is one of the favorite things to do during your tour to Diu. In this beach, various water sports facilities are available. It is completely safe for swimming. Several trees whisper and sway in the intoxicating sea breeze all day long giving you all the reason to smile during your laidback holiday. The virginity of the beach and serenity of the environs give the visitor peace and pleasure beyond expression. A perfect holiday retreat, Diu Jallandhar beach is the place where the gentle lapping waves beckon you to wade into them for a fun filled time of swimming, gamboling or just lolling around the soft sand shores or to find you napping under the palm trees filled with the soothing breeze. 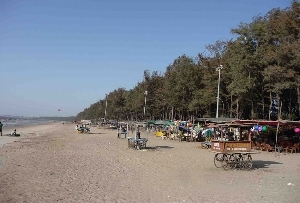 Since tourism in Diu is not yet developed to such an extent, there are few seafront resorts. But in Nagoa beach and Jallandhar beach there are a couple of private beach resorts located right on the beach side. Jallandhar Beach, Diu is synonymous with beauty, peace and tranquility. A natural aquarium is another fabulous attraction. 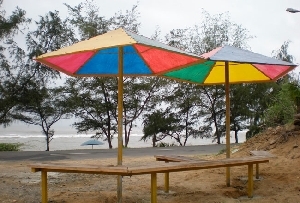 Jallandhar beach in Diu is well known for its beachfront dining and amazing sea view. It is a casual place to relax and take pleasure in the scenic beauty and dive into the waters of the sea. 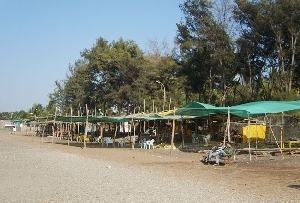 Jallandhar Shrine is located on a hillock close to the beach. This small shrine crowned with a dome features a stone carved face of Jallandhar, a mythological demon who was killed by Lord Krishna. In the close vicinity there is also a temple of Goddess Chandrika. The beach is at a distance of 1 kms from Diu Town. 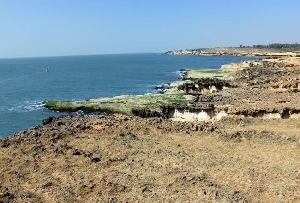 Diu Jallandhar Beach was named after the King Jallandhar who once ruler over the place.